Construction workers put the finishing touches to the |multi-deck car park. GLIDE across a free skating rink as part of the celebrations for the opening of the new multi-deck car park at Mandurah Forum on Thursday. 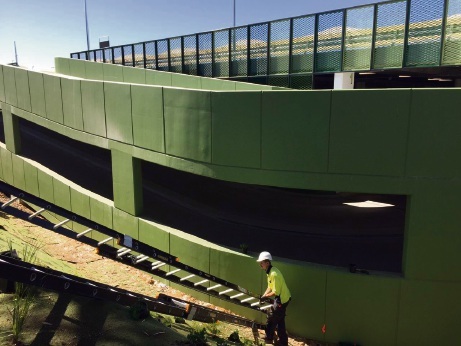 The 850-bay multi-deck will be officially opened at 7.50am, on the corner of Dower and Clarice streets. The skating rink will open at 8am and run until Christmas Eve. A further 850 parking bays at the eastern end of the centre will open in February. A spokesman for developers Vicinity Centres said the multi-deck was arguably the best in WA and possibly Australia. Available spaces on the lower deck would be indicated by flashing lights and sails will shade the upper level. He said the builders were making good progress and stage one was running ahead of schedule. He said the City of Mandurah had been very supportive.